BROWARD COUNTY, FL – Broward County’s Port Evergladescompletely remodeled its sixth cruise terminal in five years with $24 million worth of renovations and upgrades designed for greater efficiency and guest convenience. Cruise Terminal 4 officially opened today with a ribbon-cutting ceremony that also celebratedBroward 100, the County’s centennial year and commitment to the arts. The ceremony was attended by travel agents, elected officials and cruise line executives who toured the modernized cruise terminal and were entertained by grant recipients from Broward’s Cultural Division. Port Everglades is one of the world’s leading cruise ports, this year exceeding 4 million passengers and ranking as the second busiest multi-day cruise port in the world. "Florida is far and away the largest cruise market in the world. Over 14 million revenue passengers a year cruise from Florida ports. Through partnered investments with federal and local government, and cruise industry commitments, FDOT and the state’s seaports will continue to support and grow Florida’s cruise business," said Richard Biter, Assistant Secretary for Intermodal Systems Development for the Florida Department of Transportation. "Port Everglades’ Terminal 4 renovation is the latest manifestation of this partnership. These public infrastructure investments create the foundation to support the private sector investments, and individual expenditures that create economic activity and prosperity for the citizens of Florida." Installing a prominent art piece by South Florida artist Xavier Cortada. Cortada’s work, entitled “Pelican Path” is a 4-foot by 40-foot ceramic mural that will be used to guide cruise guests from the arrival area and onto their ship. In addition, the terminal’s many energy-efficient improvements will qualify the facility to become certified through Leadership in Energy and Environmental Design (LEED) – a first for Port Everglades. LEED, a U.S. Green Building Council program, is a green building certification that recognizes best-in-class building strategies and practices. To receive LEED certification, building projects satisfy prerequisites and earn points to achieve different levels of certification. Port Everglades’ next project for this terminal will be to lengthen the adjacent slip by 250 feet, for a total 1,150 feet of berth length to accommodate larger cruise ships. The $18 million slip extension is slated to be completed by the end of 2016. Located in the second largest county in Florida, Broward County’s Port Everglades is consistently ranked as one of the three busiest cruise ports in the world with more than 4 million passengers 2014. Eight cruise lines, one ferry and more than 40 cruise ships sail from the South Florida seaport including: Balearia’s Bahamas Express, Carnival Cruise Lines, Celebrity Cruises, Cunard Line, Holland America Line, Princess Cruises, Royal Caribbean International, Seabourn and Silversea Cruises. The Port&apos;s wide-ranging fleet of cruise ships provides guests with an array of cruise vacation choices from the sunny Greater Fort Lauderdale, Hollywood and Dania Beach area. View details on the latest cruise offerings atporteverglades.net or contact us by emailing PortEverglades@broward.org. 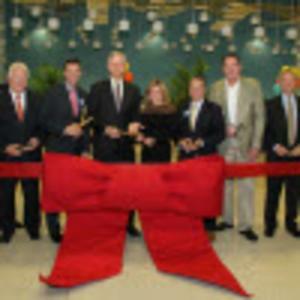 Photo Caption: Cutting the ribbon to officially open Port Everglades’ renovated Cruise Terminal 4 are, from left flanked by Broward100 actors in period costumes: Florida Department of Transportation’s Assistant Secretary Richard Biter, Broward County Vice Mayor Martin David Kiar, Port Everglades Chief Executive Steven Cernak, Broward County Commissioners Stacy Ritter and Chip LaMarca, and Division Director John Foglesong and Assistant Director Israel Rozental from the Broward County Public Works Department’s Seaport Engineering & Construction Division at Port Everglades.